Daylilies are grown for their showy and many times fragrant flowers which come in a wide range of vibrant colors. The individual blooms last only for one day but there are many blooms on strong stems that rise above tall grassy foliage. The plants will flower from early summer to fall and some varieties are semi-evergreen to evergreen in warmer climates. Plant position in the garden should be carefully considered as the flower heads turn toward the sun and the equator. The distinction between a diploid variety and a tetraploid variety is that the flowers on a tetraploid plant has much thicker petals. 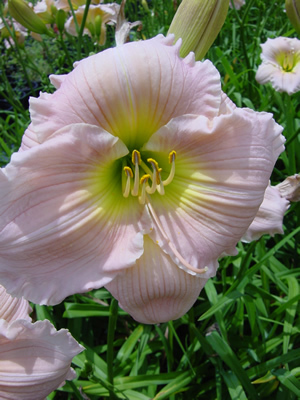 Hemerocallis ‘Barbara Mitchell’ has pale pink 6 inch flowers with a narrow pink eye band and a green throat. Plant height of 20 inches. Blooms midseason and repeats bloom cycle. Semi-evergreen in warmer climates (diploid variety). Developed by Pierce, C., 1984, a Stout Medal Winner.